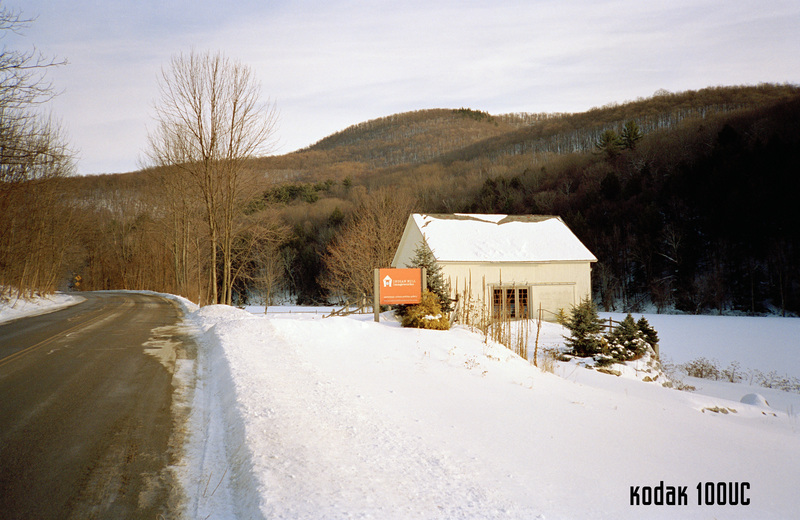 This is part 2 of my review of the new Kodak Ektar 100 film- click HERE to read part one. In this test I decided to compare the same scene photographed side by side, one shot with the new Kodak Ektar 100 and one with Kodak 100UC. Camera: 2 Olympus XA cameras both just calibrated and shot at F8, focused at infinity. 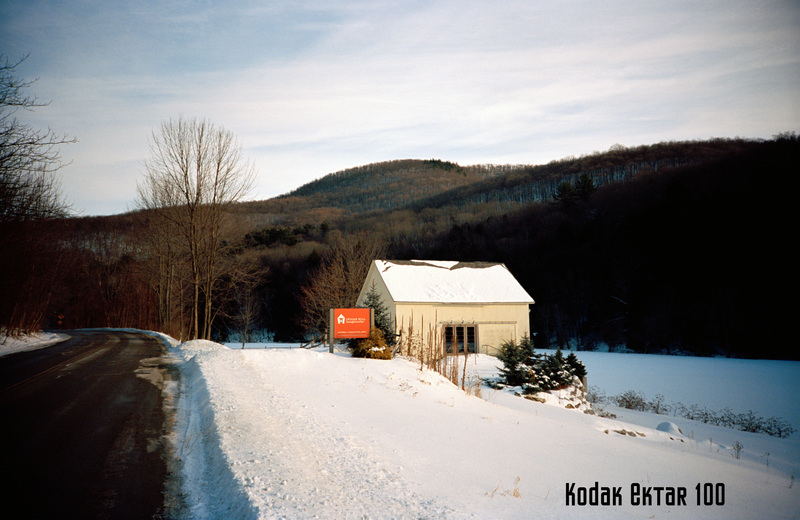 Film: Kodak Ektar 100 rated at box speed (100) and Kodak 100UC also rated at box speed (100). Scanned on an Imacon scanner (dry) at 3000 PPI so around a 68MB 16 Bit RGB file. No sharpening applied in the scan or in Photoshop. All scanner settings were set for Standard RGB Negative with full auto applied. In Photoshop only AUTO settings were used (levels, contrast and color)- no additional image manipulation was applied. Test files were then down sampled to 8 Bit and reduced to 10″ x 6.5″ for faster download- saved as a JPEG, Level 10. Please only download the sample files if you have a high speed internet connection as they are around 3MB each compressed. The Kodak 100 UC has a better exposure latitude, especially at box speed than Ektar 100 does but the grain is a bit more pronounced and the color is somewhat muted whereas the new Kodak Ektar 100 at box speed is a bit thin but has nice saturated colors and somewhat finer grain. Exposing the new Kodak Ektar at an EI of 50/ 64 will make this film very hard to beat. Overall both films are quite nice but I tend to like the look of the Ektar best, especially when exposed at an EI of 50/ 64. I find scanning the new Kodak Ektar film quite easy and possible enlargements from a good sharp capture lens and a good quality scanner with a bit of work in Photoshop can produce some amazing quality prints even at sizes up to say 20″ x 30″… remember this is 35mm! Note: If you want to try this film be sure to rate it at an EI of 50/ 64 otherwise your shadows will be thin and you will not be seeing all that is possible from this new offering. Yes, I like this film! Please note that the sample files are for personal use only and are Copyright Stephen Schaub, 2009. With these 4 films I can fit just about any color range I need and also have the ability of different film speeds. I’ve gotta say the Ektar does it for me. I just love saturated films. I still haven’t fallen out of love with E100VS. Love that stuff. I’ve been playing with a few scans of Ektar 100 and Reala 100. The grain is definitely better with Ektar, but that’s not the only issue. Ektar seems to scan with less artifacts than Reala. I won’t be putting Reala away for good, but when I would normally be using E6 film, I could probably use Ektar instead. As to my scans, I can pull the same amount of detail from a 4000ppi scan as I can from my 15mp Pentax K20D @ 16×24…..but the film image looks more natural to my eyes. The comparison pictures are nicely done, but you haven’t mention about the shutter speed. Are they the same? How would you compare Ektar 100 to E6 films? Which do you think is sharper and scans better? Negative material has a better range and in most cases the new formulations are much easier to scan… the others factors you mentioned are really based on the scanner and the skill level of the operator. When you advise to rate it at ISO 50 or 64, do you meter for the shadows? IME, Ektar tends to blow out rather quickly compared to Portra 400. If you place your shadow value at Zone 3 or Zone 4 depending on your school of thought you should be fine… yes, Ektar has more contrast but highlights should be just fine.